This article is about the substance used to set dyes. For the musical ornament, see Mordent. For other uses, see Mordant (disambiguation). Mordant red 19 is a typical mordant dye. Like many mordant dyes, it features the azo group (RN=NR) and various sites for chelating to metal cations. A mordant or dye fixative is a substance used to set (i.e. bind) dyes on fabrics by forming a coordination complex with the dye, which then attaches to the fabric (or tissue). It may be used for dyeing fabrics or for intensifying stains in cell or tissue preparations. As applied to textiles, mordants are mainly of historical interest because the use of mordant dyes was largely displaced by directs. The term mordant comes from the Latin mordere, "to bite". In the past, it was thought that a mordant helped the dye bite onto the fiber so that it would hold fast during washing. A mordant is often a polyvalent metal ion, often chromium(III). The resulting coordination complex of dye and ion is colloidal and can be either acidic or alkaline. Iodine is often referred to as a mordant in Gram stains, but is in fact a trapping agent. Pre-mordanting (onchrome): The substrate is treated with the mordant and then the dye. The complex between the mordant and dye is formed on the fibre. Post-mordanting (afterchrome): The dyed material is treated with a mordant. The complex between the mordant and dye is formed on the fibre. The action of the mordant on the substrate: if the mordant and dye methods are harsh (for example, an acidic mordant with an acidic dye), pre-mordanting or post-mordanting limits the potential for damage to the substrate. The stability of the mordant or dye lake or both: the formation of a stable dye lake means that the mordant can be added in the dye without risk of losing the dye properties (meta-mordanting). Dye results can also rely on the mordant chosen as the introduction of the mordant into the dye will have a marked effect on the final color. Each dye can have different reactions to each mordant. For example, cochineal scarlet, or Dutch scarlet as it came to be known, used cochineal along with a tin mordant to create a brilliant orange-hued red. Residual iron mordant can damage or fade fabric, producing "dye rot". The dye lake is an insoluble complex formed upon combining the dye and mordant, which then attaches to the substrate. Mordants increase the fastness of the dye since the higher molecular weight dye is now bonded to the fibre. The type of mordant used can change the colour of both the dye-plus-mordant solution and influence the shade of the final product. Unlike cotton, wool is highly receptive toward mordants. Due to its amphoteric nature wool can absorb acids and bases with equal efficiency. When wool is treated with a metallic salt it hydrolyses the salt into an acidic and basic component. The basic component is absorbed at –COOH group and the acidic component is removed during washing. Wool also has a tendency to absorb fine precipitates from solutions; these cling to the surface of fibres and dye particles attached to these contaminants result in poor rubbing fastness. 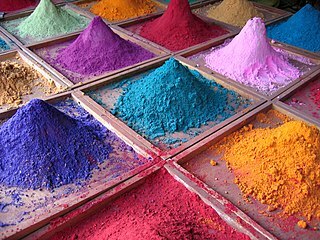 The discovery of Congo red in 1883, followed by many other synthetic azo dyes, heralded the demise of mordant dyes. Like wool, silk is also amphoteric and can absorb both acids and bases. However, wool has thio groups (-SH) from the cystine amino acid, which act as reducing agent and can reduce hexavalent chromium of potassium dichromate to trivalent form. The trivalent chromium forms the complex with the fibre and dye. Therefore, potassium dichromate cannot be used effectively as mordant. In histology, mordants are indispensable in fixing dyes to tissues for microscopic examination. Methods for mordant application depend on the desired stain and tissues under study; pre-, meta- and post-mordanting techniques are used as required. The most commonly used stain used in diagnostic histology of animal tissues is Harris' haematoxylin as part of a haematoxylin and eosin (H&E) stain. ^ Klaus Hunger, Peter Mischke, Wolfgang Rieper, Roderich Raue, Klaus Kunde, Aloys Engel: "Azo Dyes" in Ullmann’s Encyclopedia of Industrial Chemistry, 2005, Wiley-VCH, Weinheim.doi:10.1002/14356007.a03_245. ^ a b c Llewellyn, Bryan D. (May 2005). "Stain Theory – How mordants work". Archived from the original on August 14, 2007. ^ Phipps, Elena (2010). Cochineal Red The Art History of a Color, p34. Yale University Press, New Haven and London. ISBN 978-0-300-15513-6. Buchanan, Rita (1999). A Weaver's Garden: Growing Plants for Natural Dyes and Fibers. Courier Corporation. ISBN 9780486407128. Barber, E. J. W. (1991). Prehistoric Textiles: The Development of Cloth in the Neolithic and Bronze Ages with Special Reference to the Aegean. Princeton University Press. ISBN 069100224X. A dye is a colored substance that has an affinity to the substrate to which it is being applied. The dye is generally applied in an aqueous solution, and may require a mordant to improve the fastness of the dye on the fiber. Staining is an auxiliary technique used in microscopy to enhance contrast in the microscopic image. Stains and dyes are frequently used in biology and medicine to highlight structures in biological tissues for viewing, often with the aid of different microscopes. Stains may be used to define and examine bulk tissues, cell populations, or organelles within individual cells. 7. They are oxoanions of chromium in the 6+ oxidation state and are moderately strong oxidizing agents. In an aqueous solution, chromate and dichromate ions can be interconvertible. Dyeing is the application of dyes or pigments on textile materials such as fibers, yarns, and fabrics with the objective of achieving color with desired fastness. Dyeing is normally done in a special solution containing dyes and particular chemical material. Dye molecules are fixed to the fibre by absorption, diffusion, or bonding with temperature and time being key controlling factors. The bond between dye molecule and fibre may be strong or weak, depending on the dye used. Dyeing and printing are different applications; in printing color is applied to a localized area with desired patterns and in dyeing it is applied to the entire textile. Potassium dichromate, K2Cr2O7, is a common inorganic chemical reagent, most commonly used as an oxidizing agent in various laboratory and industrial applications. As with all hexavalent chromium compounds, it is acutely and chronically harmful to health. It is a crystalline ionic solid with a very bright, red-orange color. The salt is popular in the laboratory because it is not deliquescent, in contrast to the more industrially relevant salt sodium dichromate. An acid dye is a dye that is typically applied to a textile at low pH. They are mainly used to dye wool, not cotton fabrics. Some acid dyes are used as food colorants. Hematein or haematein is an oxidized derivative of haematoxylin, used in staining. Haematein should not be confused with haematin, which is a brown to black iron-containing pigment formed by decomposition of haemoglobin. In the Colour Index, haematein is called haematine, a confusing word that wrongly implies that the compound is an amine. Hematoxylin and eosin stain or haematoxylin and eosin stain is one of the principal stains in histology. It is the most widely used stain in medical diagnosis and is often the gold standard; for example, when a pathologist looks at a biopsy of a suspected cancer, the histological section is likely to be stained with H&E. A combination of hematoxylin and eosin, it produces blues, violets, and reds. Phosphotungstic acid haematoxylin (PTAH) is a mix of haematoxylin with phosphotungstic acid, used in histology for staining. Phosphotungstic acid (PTA), tungstophosphoric acid (TPA), is a heteropoly acid with the chemical formula H3PW12O40. It is normally present as a hydrate. EPTA is the name of ethanolic phosphotungstic acid, its alcohol solution used in biology. It has the appearance of small, colorless-grayish or slightly yellow-green crystals, with melting point 89 °C (24 H2O hydrate). It is odorless and soluble in water (200 g/100 ml). It is not especially toxic, but is a mild acidic irritant. The compound is known by a variety of different names and acronyms (see 'other names' section of infobox). In textile manufacturing, finishing refers to the processes that convert the woven or knitted cloth into a usable material and more specifically to any process performed after dyeing the yarn or fabric to improve the look, performance, or "hand" (feel) of the finish textile or clothing. The precise meaning depends on context.